As though Afghanistan’s problems couldn’t get any worse, the UN Office on Drugs and Crime’s most recent Afghanistan opium survey  (released in November last year) was a stark reminder of the challenges facing the war-torn nation. 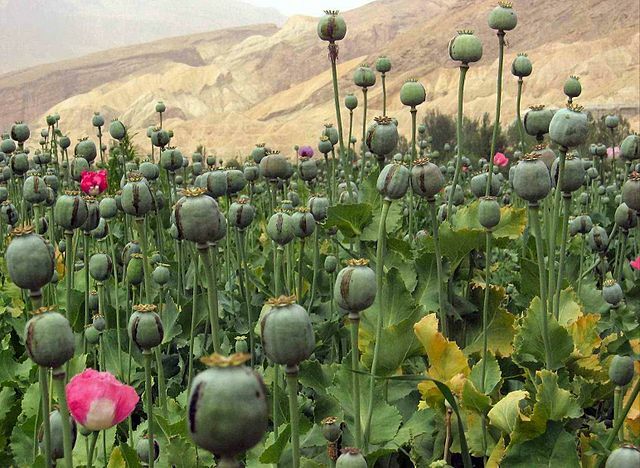 Despite a 20% decline in the area under poppy cultivation between 2017 and 2018 (caused mostly by drought), opium production was still very high at 6,400 tons. The resurgence of the illicit drug trade in Afghanistan is unprecedented; the country is now the source of almost 90% of the global supply of heroin. Despite the ongoing presence of the International Security Assistance Force (ISAF) and US$8.6 billion  spent on counter-narcotics efforts, the drug trade has not only survived but flourished. Total in-country interdiction efforts from 2008 to 2018 accounted for seizures equal to only 5% of the total opium output in 2017. It’s surprising that the issue of narcotics is rarely mentioned outside of counter-narcotics circles, particularly when discussing the future of Afghanistan. Despite overwhelming evidence suggesting a link between the narcotics trade and the insurgency, illicit drugs have never featured as a core security issue. Yet, if the Taliban received only 10% of the annual narcotics revenue in Afghanistan, it would accumulate US$150–200 million every year to fund its insurgency, and estimates of profits from the trade have often been much higher . In an interesting lesson for ISAF, the Taliban’s poppy eradication efforts proved to be disastrous not only for the wellbeing of the Afghan people but also for the group’s local support. The lack of support ultimately contributed  to the Taliban’s rapid removal from power following the US-led intervention in late 2001. The group was unlikely to make the same mistake again. After the US intervention, narcotics production began to expand rapidly and has continued to increase throughout the war. Today, the trade provides the equivalent of 354,000 full-time jobs , mostly within Taliban-controlled territory, and is equal to 7% of the nation’s GDP. This provides a number of challenges for the Afghan government and casts further doubt on its ability to form a fully functioning state. It’s no secret that many commentators  are highly sceptical about the likely success of the ongoing peace negotiations between the US and the Taliban. This is not to suggest that such ventures are a waste of time. On the contrary, a RAND Corporation study  into 648 terrorist groups over 38 years found that, in 43% of instances, those conflicts ended through political negotiations. The reason success is less likely in Afghanistan has more to do with the Taliban’s lack of incentive to negotiate. The US Special Inspector General for Afghanistan Reconstruction’s 2018 report  on narcotics provided a bleak summary of many of these challenges. The report cited a consistent failure to achieve consensus among the ISAF member nations and the Afghan government on the importance of this trade in defeating the insurgency. It also bluntly surmised that no counter-narcotics initiative in the history of the conflict had resulted in any long-lasting reductions in opium production. After 17 years and with a reduced ISAF footprint in the country, methods to address this threat are now limited. This may have contributed to a recent year-long air campaign to target drug labs throughout the country, which produced questionable results . Such actions have their merit but are unlikely to have any impact without a holistic and prioritised strategy. It may well be too late to develop such a strategy, however, and it probably wouldn’t have the support from the Afghan government that would be required to make tangible progress.